It took Tia two years to convince me to go with her to quilt retreat. At first, I thought they were expensive and that I could use the money for fabric. However, I under-estimated the benefits of quilt retreat! 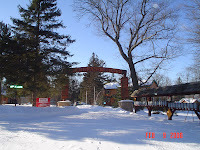 On February 8 - 10th, I attend a retreat at the Woodland Beach Resort in Deerwood. It was held in two of their new buildings. We had the resort to ourselves as their other "cabins" were not heated. There were about 23 or so ladies at the retreat. It is so much fun to meet new people, connect with friends, learn a new skill, and be inspired by other's ideas and work! At quilt retreat, we can sew, sew, and sew and not have the necessities of cooking and other typical household tasks keep us from completing our projects! It is very nice to have the uninterrupted time as well as the comparaderie of fellow quilters!